I’ve had enough trouble, trauma and tragedy. As you know, I’ve brooded enough about it. So, I’m done. And all I can do is be kind to my fellow peeps and anipals. Be the best little doggie I can be. I can’t change the world (unless I’m elected King and some of my pals think I’d be good at that), but I can be responsible for myself can’t I? It may not be the biggest ArrOOOO I’ve got, but it’ll do. Thank you, Aunt Sharon, for helping me snap out of it. Yes. Like in Moonstruck. You slapped me. Times are rough out there in the big world. I’ve got enough trouble of my own to worry about. Eating. Napping. Playing. Walking. Taking care of my peeps. Staying out of harm’s way. I can’t take on the world, but I can move on and respect life in all forms. Except when I need to, you know, be a terrier and take care of business. Be very afraid squirrels. Very. AFRAID. Huuummm…..perhaps I should be kinder to squirrels??? This entry was posted in Scotties, Scottish Terriers, Terriers, The Scottie Chronicles and tagged dogs, grief, life, peace, pets, sadness, strength, terrorism, violence. Bookmark the permalink. Those are very wise words from Aunty Sharon! I’m going to go lick my peeps. Right Now. 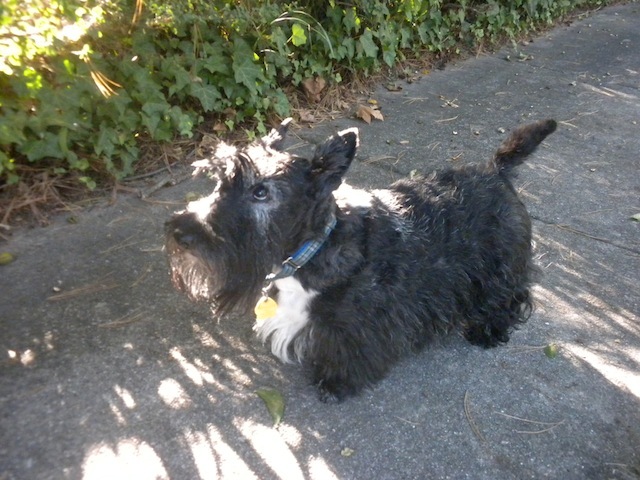 Arooo to Stuart the Scottie! We had enough to, so we are sharing Stuarts blog today. You are so kind. Thank you! We are one in solidarity. You can’t worry about things you can’t change or control-that’s nuts. Speaking about nuts, it’s time for some! I’m still trying to dehydrate my sweet potato. Hang in there, little Scottie!!! A walk on the beach is a great way to regain some peace of mind! I’m better now. Hey, I liked your big pencil post. Made me feel like I’m not alone. And a FINE arrooooo that was! Sophie and Shelby AROOOed back at you. Sidney was busy avoiding the girls and had no comment. I’ll take an arrooo whenever I can get it. And that Sidney, well, he can get what he wants, right? I thought that was a pretty darn good AROO. Well, Maxwell, I appreciate that my friend. We agree and since we can’t arroo, we bark back. Barking is a good thing. There’s no such thing as a pathetic attempt my dear one. Things can be tuff, but a lil terrier cuteness in da world always makes it a better place. I agreeeeeeeeee! That makes two of us! As usual, you are soooooooooo right! Triple ‘Rooooos from us. Elsa does the best Rooo and she’s not even a Scottie. (Puts Andy and me to shame). I luv me some arrroooos! Oh Stuart, you are so right. It’s hard to constantly hear bad and sad news. If everyone just took it upon themselves to be kind think of how much better things would be! I guess all we can do is take care of ourselves. Love to see you and hear you! You guys, you’re right. Take care of ourselves. arOOOOOOO to bad news. No more! She’s a smart one that Aunt Sharon. My peep said everybody should sing a few verses of What The World Needs Now Is Love Sweet Love! Made me feel better too! ROOOO! Thanks much for the Arooooooooo, you sure made us feel better, we went right out and some aroooooo’s also! It’s amazing what an arrooo will do you two! We’re with ya, Stuart. We are so sad about the terrible things that are happening in our world today. But, we can take care of those that are important to us! Keep those arooos going! Singing always makes things better. Let’s sing together….. ready?… ArrroOOO ROOOOO rooo. Ya gots to be kiddin’ me, right? Just checking to see if you’re paying attention pal. Stu, we hear you and we join you-AROOOOOOOOOO!!! ArrrrOOOOOOs to you my anipals! Pee Ess: Squirrels don’t count! MOL!! Thank you Marty for making my day! Oh Stuart your ArrOOOO gave your Auntie a little happy tear in her eye. Ooooo. A good idea. Thanks!